Although fall brings a lot of wonderful and natural presents to the nation including gorgeous changing leaves and crisp, clean air, it can also bring along some new and unpleasant illnesses. Everything from the flu to the common cold tends to run rampant once the seasons change, and this can be a miserable time for all involved. If a loved one, co-worker or friend is suddenly feeling under the weather, there are a few things you can do to try and improve their mood. A great way to help a friend out may be to bring over some chicken soup. This tried-and-true method often helps people feel better and your friend may be happy to have some on hand when he or she gets hungry. Another perfect way to help a loved one or friend feel better is to send a get well gift basket. 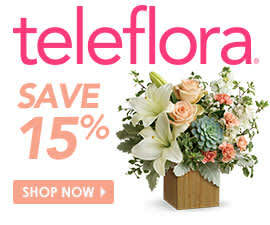 A collection like Teleflora's Smiles for Miles may add the right glow to brighten up your sick loved one's day. This arrangement of lilies, roses and gladioli come in a mix of yellow and green that are sure to help a loved one feel better. The flowers are delivered in a modern-style bamboo box that can be used to store more flowers down the line.